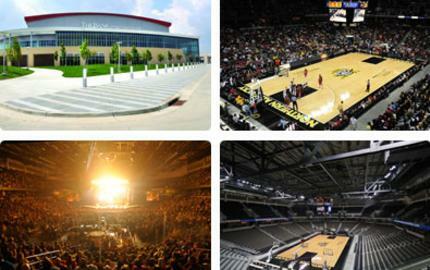 Opened in 2008, the $64 million, state-of-the-art BB&T Arena is the midwest&apos;s premier, multi-purpose arena facility designed specifically to host sporting events, large faith-based celebrations, regional events and competitions, training camps, motivational rallies and conventions, live concerts, family shows and more. Located on the beautifully landscaped campus of Northern Kentucky University, the 245,000 square foot, bowl-shaped arena boasts a capacity of nearly 10,000 seats for most events – 9,400 for basketball games – and has a specialty curtaining system that allows the venue to be cut to half size. You&apos;ll find two decks of seating, 12 luxury boxes, two party decks that accommodate up to 100 people and two party suites that seat up to 50. You and your guests will enjoy ample on-site parking, a safe suburban location and numerous facilities for private meetings and conferences, along with full service catering options and many modern amenities. The BB&T Arena – proudly managed by SMG, the world leader in facility management – is committed to unmatched customer services before, during and after your event.